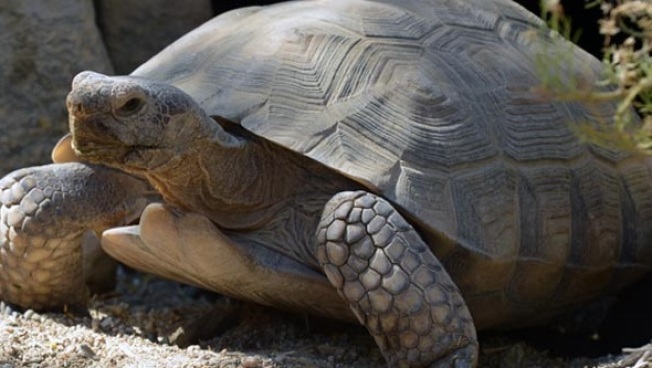 The Living Desert's famous desert tortoise leaves her burrow when spring is nigh. Nighty night, sweet tortoise: Mojave Maxine is in a state of brumation as winter begins, but she'll trundle out of her burrow in February, if past years are guides. Who will guess the right date and time? Stay tuned. MOJAVE MAXINE, a desert tortoise who calls The Living Desert in Palm Desert home (that's a lot of "desert" in one sentence, true, but the desert does rule things in Maxine's amazing world). Some think of Mojave Maxine as the Punxsutawney Phil of California, though surely that sweet shadow-seeking groundhog wouldn't mind it if we referred to him as the Mojave Maxine of Pennsylvania. This is all to say this: The shell-rocking superstar settled down for her annual brumation period, or cold-blooded hibernation, around Dec. 6, 2017. She won't wakey-wakey for several weeks, and if past years are a guide, she'll pop out (which means slowly and grandly walk out, tortoise-style) from her burrow around the beginning of the second week in February. THERE'S A CONTEST, for students, involving just when she'll emerge, so read all if you have a schoolkid in the house. And whenever things get too harried, with the holidays, just think of that adorable desert tortoise. Ponder, too, just when Mojave Maxine will emerge, which some say means spring has officially arrived in the glorious California desert.